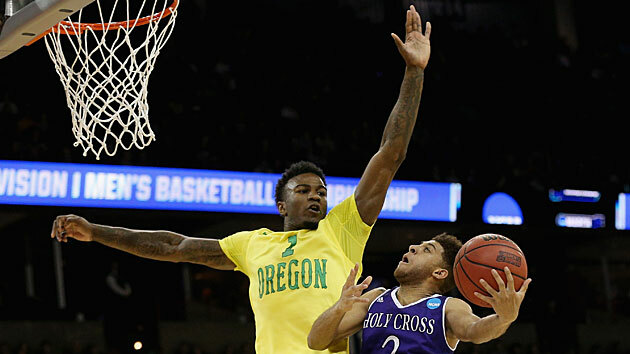 The top-seeded Oregon Ducks had no trouble putting away 16th-seeded Holy Cross and advancing to the second round of the NCAA tournament. Oregon, the No. 1 seed in the West Regional, kicked off its 2016 NCAA tournament with an easy tune-up against 16th-seeded Holy Cross. The Ducks' starting frontline of seniors Chris Boucher and Elgin Cook and sophomore Dillon Brooks combined for 41 points and 25 rebounds and backup Jordan Bell had eight points, eight rebounds and three blocks in the 91-52 win in Spokane. Overall, Oregon outrebounded the Crusaders 47-27 and ensured that No. 1 seeds would remain perfect against No. 16s in the NCAA tournament. The Ducks, the Pac-12 regular season and tournament champions, didn't figure to get much of a challenge from the 14-19 Crusaders, but as we were reminded across the country this week, nothing is guaranteed in the Big Dance. For all intents and purposes, though, the tournament really begins for Oregon on Sunday. It unquestionably has the offense to advance all the way to the Final Four, as evidenced by its 55.7% shooting. We’ll begin to find out whether or not the defense is there, as well, in the second round when the Ducks face a much tougher opponent. On Sunday Oregon will face the winner of the late game in Spokane between No. 8 Saint Joseph's and No. 9 Cincinnati. No matter which team it is, it will desperately try to slow the Ducks down. As they’ve proved all season and again on Friday, that is much easier said than done.